Ready to use white paste, based on acrylic resins and fine, low absorbency aggregates. 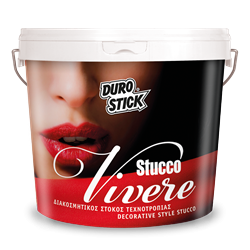 A product suitable for creating decorative styles on a variety of surfaces. Its special formula allows for the creation of artistic expressions with high decorative interest, giving the majestic feeling of marble with incredible veining. It has excellent adhesion on properly prepared surfaces; it is easily workable and it applies perfectly. Its white color is the basis for creating a wide range of 120 colors, through DUROCOLOR, the measuring system for shade rendering of DUROSTICK. Apply it on skimmed walls and ceilings, drywall previously primed with AQUAFIX and cement boards. Apply it on previously painted surfaces but also on properly prepared metal and wood surfaces, such as wood doors, existing furniture etc. Its excellent plasticity and strong grip allows its application on a multitude of constructs such as benches, sofas, tables, beds, fireplaces, columns etc. 1kg/2-3m², on properly prepared surfaces.